A propaganda train displaying weapons and military vehicles that the Russian military seized in Syria is now en route from Moscow to the far eastern port city of Vladivostok. Many of the weapons on show in the train's carriages were made in the U.S., France, Israel and Italy. The exhibition is supposed to convince Russians how vital it was to help Syrian president Bashar Al Assad whom many in the West view as a war criminal. Most millitary analysts say that until Russia intervened Assad was losing the war against Syrian rebel fighters. Russia's warplanes are reported to have killed many civilians in Syria, as have Syrian warplanes. The medical charity Doctors without Borders said Russia bombed a medical clinic in the northern province of Idlib in 2016. And the UK-based Syrian Observatory for Human Rights has repeatedly accused Russia of killing civilians in airstrikes. In September 2017 it reported that a series of strikes killed 69 people in just 72 hours. Russia began bombing Syria in September 2015 and but it has alway said it's been targeting so-called Islamic State and its fighters. The train's first destination is Sevastopol, the capital of Crimea which Russia annexed from Ukraine. In all the train will travel 28,500 kilometres, conveying the message that many weapons used against Russia were made in Europe by NATO members states. And military guides who fought in Syria will be on hand to talk to the public. 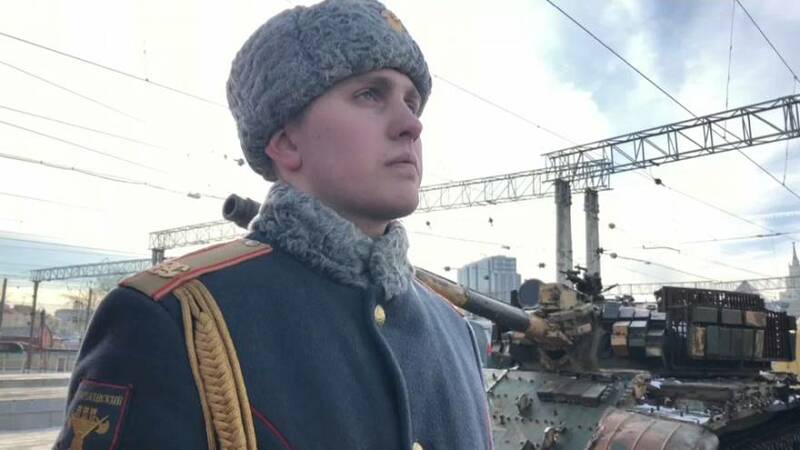 "This train is going to show people what we are fighting against in the Syrian Arab Republic," said one army major, Kalno Aleksandr, at Moscow's Kazansky station. Those who came to see the propaganda train before it left appeared proud of what they had seen. “We see in the technology that we have been opposed by really serious weapons, we are glad that they are winning with honour, with dignity,” said one man, Kubrak Aleksei. And the train will not only try to drum up support for Russia fighting in Syria, it will also hope to recruit more men and women into the military.